Why Am I Writing About Evergreen Wealth Formula? When I first found Evergreen Wealth Formula through Nathaniell's website one-more-cup-of-coffee, I was quite disturbed with what I found inside his article. Don't get me wrong, it's not Nathaniell that caused this alarming situation but James Scholes, founder of Evergreen Wealth Formula. James is giving the impression on his blog post that Wealthy Affiliate members are scammers. This includes claiming that affiliate marketing formula taught inside Wealthy Affiliate is meant to promote the program rather than to produce high quality content. He did this by showing proof of Wealthy Affiliate members providing inaccurate information about his product on their website including his other “so-called proof” which I'll show later. 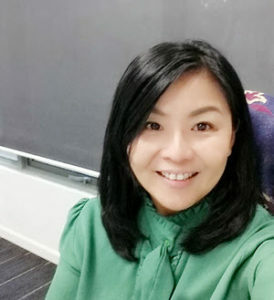 Before I even continue, I would like to let you know that I am member of Wealthy Affiliate and has no intention to buy Evergreen Wealth Formula as of now. Not because this product is bad, but the method taught inside is not what I want. I still prefer SEO method to drive traffic that's hardly taught inside Evergreen Wealth Formula. Furthermore, I am not comfortable with the hyped-up claim by Evergreen Wealth Formula that anyone can start generating sales …. TODAY, if you buy this product. This claim is giving me the impression (and I believe others too) that I can make MANY SALES starting from the very first day EASILY. Here's the claim shown as title of Evergreen Wealth Formula throughout its sales video. 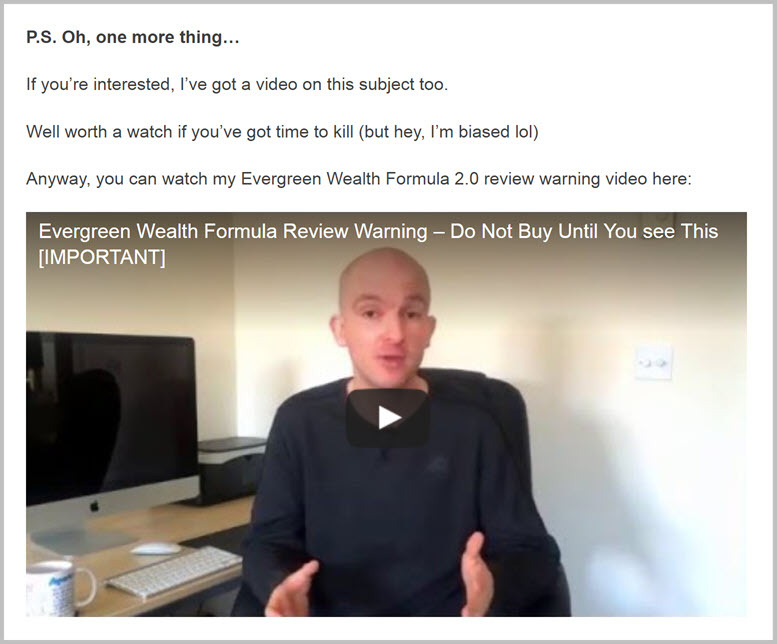 In this post, I will share with you my honest critical review of some of the claims made by James Scholes of Evergreen Wealth Formula inside his post and let you decide whether Wealthy Affiliate is really what he claims to be. What is Evergreen Wealth Formula and Wealthy Affiliate? I wouldn't want to go into details to explain about Evergreen Wealth Formula nor Wealthy Affiliate. In general, both companies offer different strategy to help their members make money online. Evergreen Wealth Formula teaches members about sales funnel, list building, emails, Facebook campaigns with little SEO strategy taught inside this program. There are upsells inside member's area. Whereas Wealthy Affiliate focuses to teach people how to create SEO-optimized content of their chosen niche to promote affiliate products. Tools required to apply this strategy are provided inside the program without the need for members to pay more. Some people call this method niche marketing, affiliate marketing or content marketing. Both program can potentially help people make money online as methods taught inside are proven methods used by many successful marketers. But why is James Scholes, founder of Evergreen Wealth Formula call Wealthy Affiliate members scammers? And were the proof shown in his article real? What about Wealthy Affiliate members? Why are they calling Evergreen Wealth Formula a scam (if there's any)? Let's find out the conflicting views from both parties. How James Scholes Call Wealthy Affiliate Members Scammers? James Scholes in his article is calling Wealthy Affiliate members scammers. He came into this conclusion by sharing some proof of unethical behavior of WA members on his blog post. Inaccurate Product Information Provided By Wealthy Affiliate Members : There are some Wealthy Affiliate members sending request to Evergreen Wealth Formula to become their affiliate but was rejected. This is because only members of Evergreen Wealth Formula are eligible to promote this product. Below is the screenshot taken from James's article. 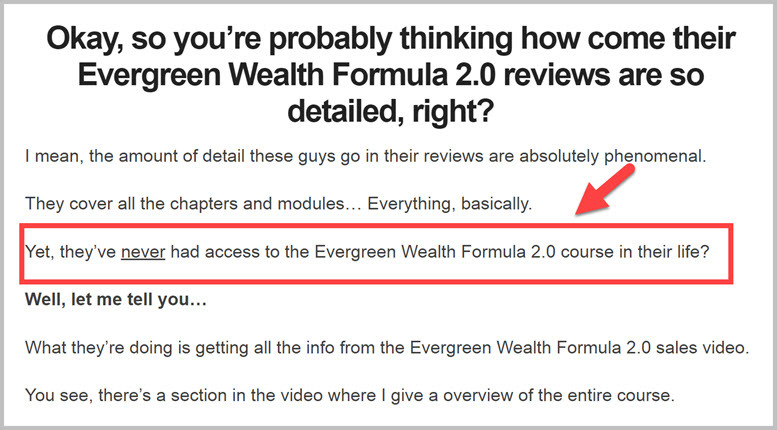 Without the ability to assess this product as an affiliate, some members of Wealthy Affiliate failed to provide accurate and up-to-date product review about Evergreen Wealth Formula. This is something that I must apologize on behalf of some Wealthy Affiliate members. There are indeed few outdated product reviews on the web. I hope in future Evergreen Wealth Formula can approve non-member as affiliate of this program so a more comprehensive and accurate product review can be produced. Review Not Based On Real Experience: Many product reviews made by Wealthy Affiliate members were produced based on desktop research as claimed by James. Indeed this is true. I am also one Wealthy Affiliate member who write product reviews without buying into some of the products that I am reviewing. I know you might be thinking this is unethical. But please give me a chance to explain more before you jump into any conclusion. Look, scholars produce literature reviews based on previously published journals, white papers and reports (can be more than 10 years) as a basis for funding proposal so they have money to start their research. All they did were desktop research. These scholars were not even part of the journal report, yet their literature review is acknowledged as part of a legit document inside funding proposal to help sponsors make a decision. What every reviewer does is the same as scholars did – that is to collect information from both positive and negative perspectives (from real users or credible sources), then produce a critical analysis on the subject matter based on personal opinion and provide recommendation. Their intention is the same, that's to help readers make wise decision after reading critical review about a product. If all Wealthy Affiliate members are called scammers just because they provide review without buying into the product, I guess all scholars might be considered the same too. As they too didn't conduct the research published in existing journals or reports but merely leveraging on the information to convince sponsors for funding. Personally, I do not agree that product review has to be produced based on real experience, despite it's a better way. Fake comment on product review: Yes, Wealthy Affiliate does provide a platform for members to comment on other members' website. But the intention is to help members explore the strategies and methods used by other member's sites at the same time help with page rank. Members are taught to provide relevant and genuine comment but not to spam. Unfortunately, many people have no patience with success. This is the reason why some member's comment carry little relevance or with inaccurate information. They just failed to read the entire article and simply comment. This is one shortcoming of Wealthy Affiliate program which I've highlighted on my post pertaining 5 Things I Don't Like About Wealthy Affiliate. WA Members Site Are Not Creating Value For Readers: This is one negative claim that I strongly DISAGREE. There are thousands of Wealthy Affiliate members' site out there. By just showing a few sites and start making assumption that Wealthy Affiliate members are not creating value for readers is really unfair. A good product review can help readers make the right decision. If James claims that Wealthy Affiliate members are not creating value just because members write product reviews but not “how to guides”, then he doesn't really understand the true meaning of VALUE. VALUE is very subjective and distinctive to each individual. For instant, a person who has money to invest into paid advertisement might not find any value in Wealthy Affiliate as this program focuses to teach free traffic strategy, that obviously can't deliver fast results. 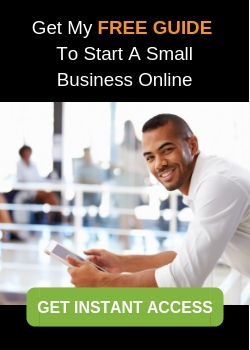 But, if a person has limited money to spend but willing to devote his/her time into building an online business, then Wealthy Affiliate will be a great value to the person because all training are geared towards investing with time rather than money. This is also the reason why I have no intention to become member of Evergreen Wealth Formula as I too prefer to invest my time more than money. Whether you are creating “how to guides” or “product reviews”, both can potentially deliver value to readers. Therefore I can't agree that Wealthy Affiliate members' sites are not creating value. After having experience with Wealthy Affiliate for 3 years, I would like to share with you my critical review on how I really think about complaints I found inside James's article. Click Bait Strategy: I would say Wealthy Affiliate indeed teaches click bait strategy to members as this is proven to work for even the most experienced marketers. Who doesn't use click bait? Even James uses this strategy inside his 3,000 words article that claims Wealthy Affiliate members are scammers. If such an experienced marketer can put in so much effort writing such lengthy article as click bait to promote his Evergreen Wealth Formula, then this strategy must be really good. Wealthy Affiliate Is Just A Platform: Will you be calling hosting providers such as Hostgator, Bluehost, Namecheap a scam if those so-called scammers' websites are hosted on their platform? What about email marketing tools that real scammers use to send promotional offers that give little to no value to you? You too won't be calling AWeber, Mailchimp and GetResponse a scam. So why associate Wealthy Affiliate with scammers when there's no proof showing this program is teaching unethical method? Wealthy Affiliate Never Teaches Members to Call Other Program A Scam: Let me SHOW you the TRUTH. Creating product review is a systematic approach. The way Wealthy Affiliate teaches this formula is nothing unethical at all. Kyle, who is the Chief Trainer inside Wealthy Affiliate never teaches members to call other people's program a scam, unless it's a real scam like MOBE or Digital Altitude. Both companies were shut down by FTC last year. And this happened after many Wealthy Affiliate members exposed their scams few years earlier. Even the baseless law suit lodged by MOBE against Wealthy Affiliate was ruled in favor of Wealthy Affiliate. Without us as product reviewers, more people will fell prey to scams and lose more money. Not only that Wealthy Affiliate didn't teach members to call other program a scam, they even stressed the importance of “DO NOT FALSIFY” statements inside their training. If you can find any proof that Wealthy Affiliate is specifically telling members to call other program a scam, then please show me so I can unsubscribe as a member. In every program, there are things people like and don't like. No program is perfect that can make everyone happy. The best way to know whether a program is good for you is to first understand your goals and personal capacity before jumping into one. You can find more ways to assess whether a program is good fit for you here. Of course, reading reviews is a must. I suggest to read at least 5 reviews from diverse perspectives, so you can make well-informed decision. Of course, the best is still to try the program. If you want to know whether Wealthy Affiliate is for you, then I suggest you to sign up as Free Starter Member and find out yourself. But for Evergreen Wealth Formula, there's no free trial. You must buy the product in order to assess for yourself. 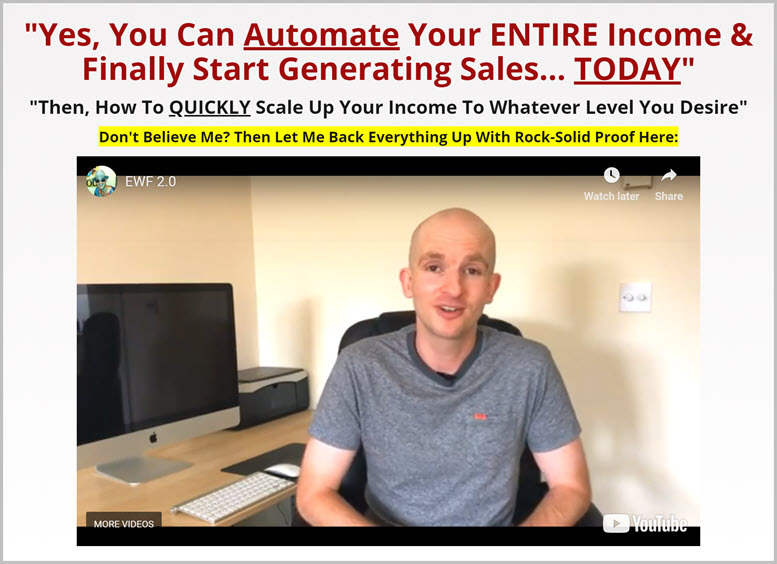 I hope by reading this post, you will have clearer picture on why James Scholes, founder of Evergreen Wealth Formula call Wealthy Affiliate members scammers. If you find this post valuable, please share on Facebook or Twitter. Or if you have any comment about my critical review on James Scholes' post, do leave me a comment below. 18 Comments on "Evergreen Wealth Formula ALERT…Wealthy Affiliate Scam"
I must say that I am glad that you solved this problem about Wealthy Affiliate being a scam. I know some people who say that wealthy affiliate is not trusted and not legit but I proved to myself that it is not true. Everyone can earn at WA but strong will and persistence are important. When I first found the post created by James Scholes, I was really disturbed and start questioning the ethical aspect of Wealthy Affiliate. But as I think through, Wealthy Affiliate is really one program that has helped myself and many others make money online. I just can’t remember if there’s any training that teaches members to call other program a scam. To prove it, I re-watch all the training video one-by-one. Luckily I stand strong with my belief and trust on Wealthy Affiliate, otherwise, I might be convinced that WA is a scam. I hope more people will put on their critical thinking cap and give Wealthy Affiliate a fair assessment before jumping to conclusion. Seriously, this type of post is really a pain. Thank you for sharing with us this critical review on James Scholas post. I can agree more with you that many people want to succeed quicker in their business and therefore will do whatever they can to achieve it. That’s why there’re untruthful comment by some unethical members. But James could have just produce ONE review on that particular “post that review Evergreen Wealth Formula”. Rather than doing the right thing, he started to call Wealthy Affiliate members scammers. His post is so misleading and giving readers the impression that Wealthy Affiliate is a scam. 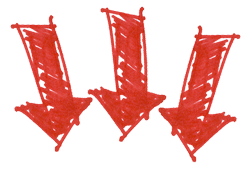 How can Wealthy Affiliate be accountable when it’s they are not the one writing reviews? I won’t even consider Evergreen Wealth Formula as James post is the one that’s unethical. However, I believe Wealthy Affiliate might need to improve its comment system to prevent some members from simply giving untruthful comment for the sake of getting more comments in return. That’s true. I don’t really like the comment and ranking system inside Wealthy Affiliate too. Many members are commenting because they just want to rank up the system. Maybe WA just have to remove its member’s ranking system. Here are some other things that I don’t like about Wealthy Affiliate. This is really an informative and educative post. You have done a good job by reviewing Evergreen Wealth Formula and Wealthy Affiliate. Reading this has really enlightened me on those platforms. All that stated about Wealthy Affiliate are facts. But like you said, no program can make everyone happy. Some really love to be a member of Wealthy Affiliate and other way round. Can i know how do you find Wealthy Affiliate? Did you really make money? Wow, a product that calls other people scummy is already bad in my book. It’s definitely not genuine and I am already less interested in buying the product as is right now. Plus how am I going to give an accurate review of a product if I can’t try it out? It’s kinda hard to do that with most products nowadays; they like to get a piece of their cake before earning it! Thanks for the warning Florence. You are welcome Murasa. I am also not keen to join Evergreen Wealth Formula as of now. But who knows I might consider after doing a research on this program. The fact is this program is offering things that’s short of inside Wealthy Affiliate. Just like Elite Marketing Pro, Power Lead System and My Lead System Pro, their training are geared towards sales funnel, email marketing and paid advertising. These are really not that comprehensively taught inside Wealthy Affiliate. I’ll definitely get one of this program, but maybe on a later stage. Thanks for this timely information. The bottom line is how to succeed and get sales. But as for me there is no need to continue to search for other online platform to learn how to succeed. Also if I don’t have solid claims I don’t call other programs scam just to promote my own affiliate programs. At wealthy affiliate I’m receiving daily motivation to continue to strive. The daily training are awesome to help. The live support and jaaxy application that can help you get Google rank are world class. Great to know that you find this post valuable. I agree with you 100%. Twisted information just to promote own’s affiliate program is a no no to me. That’s so unethical. I saw inside James Scholes post there are more than 150 comments. But when I try to assess those comments to have a feel how others think of his claim, I was not able to assess. Not sure what he’s trying to hide. However, as he wrote that article, he is already getting a lot of backlinks from members of WA and also people who didn’t make it in WA. That’s consider as click bait too right? Hi Florence, I agree with you that some comments provided by members of Wealthy Affiliate are not so genuine. Some people just abuse the system for their personal gain. This is not acceptable at all. I really hope Wealthy Affiliate can make some improvement to their comment system. For instance, they can consider to impose a minimum of 2 minutes reading an article before anyone can comment. That’s a great idea. This way, Wealthy Affiliate can prevent lazy members from giving comment without understanding the entire article. I have never thought there will be some program owners such as the one from Evergreen Wealth Formula disregards Wealthy Affiliate. It just doesn’t make sense to me. I am member of Wealthy Affiliate and the community that I know inside this program will never call another program a scam unless it truly is. I fully agree with you that WA teaches people how to produce SEO optimized contents but definitely not to simply call another program a scam. I bet what James Scholes really want is to make use of his article to get attention or comment from other Wealthy Affiliate members so that particular article get the buzz to easily ranked on Google. He’s trying to promote his Evergreen Wealthy Formula… but too bad that he’s using unethical method. That’s really mean! I like the way you cleared it in your article. You even put me on a clearer prospective of these unethical marketers who try to downgrade others just to promote themselves. To me, Wealthy Affiliate still the best. Thanks for sharing. I too feel that Wealthy Affiliate is a great program to start affiliate marketing. I wrote this article because I’ve seen more than 1 product owner calling Wealthy Affiliate members scammers. It’s really frustrating… especially when I always try to give an unbiased, honest and best product review on make money program. To tell you the truth, I spend a minimum of 5 hours conducting research to write a product review. Many times, I spend up to 10 hours just to complete one product review. How can I not be mad being called a scammer just because I learn from Wealthy Affiliate. WA never teach its members to simply call another program a scam. In fact, it advises members to always do through research on a product before producing a review. If there’s any member who simply called another program a scam, then I guess the case is isolated. It’s not fair for James Scholes to call all WA members scammers just because he found some unethical reviewers on the internet. You have raised my curiosity, is Evergreen Wealth Formula a scam or not? I have been scammed in the past so I despise scammers. But from the review its like the fist fights. 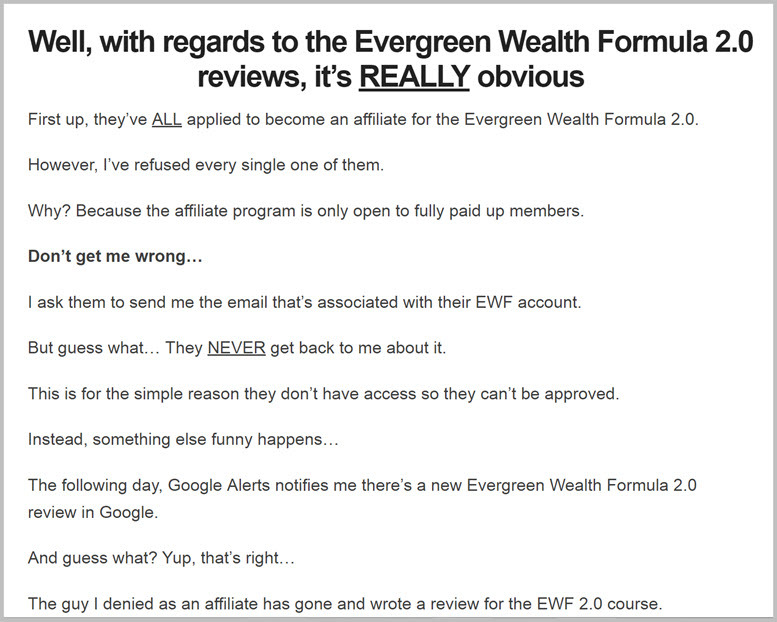 Evergreen Wealth Formula is trying to discredit Wealthy Affiliate just because of a few bad reviews? Maybe the owner just want to leverage on a few mistakes made by other people and create a free publicity for his own product. That’s not an ethical way of doing business. But one thing I am damn sure is Wealthy Affiliate is not a scam. I don’t think Evergreen Wealth Formula is a scam. But I can’t be sure either as I didn’t really look in this product. But one think I can be sure is this program focuses on quicker way to make money online which should be more geared towards paid advertising. That’s the fastest and most scalable way to see returns. It looks to me like Evergreen just wants to step on Wealthy Affiliate as a steeping stone to make themselves look better, maybe they’re jealous of what Wealthy Affiliate is offering and the long running background. We know better than that and there are plenty of people here that can vouch for that. I believe that anyone with some common sense can see beyond the get rich right off the bat approach that Evergreen is putting across is the same as any of the other get rich scams that are flooding the market, people want money and riches now an people are ready to feed on that. You have done a great job at putting your point across, great blog and keep up the great work at exposing frauds like Evergreen. Wealthy Affiliate has indeed gain traction among internet marketing community for the past few years. Not only is the membership super affordable, its training is also top notch. Despite just focusing on teaching SEO-optimized content to make money, there are also training on dropshipping, eCommerce, selling on Facebook, creating sales funnel, email marketing, landing pages, and many more. Here’s a list of complete training you can find inside Wealthy Affiliate. That’s why more and more people are joining Wealthy Affiliate. Unlike many program that provide members with Done-for-You system, Wealthy Affiliate expect members to learn, understand and able to take action on the fundamentals of internet marketing. Members must be able to learn how to create their own systems so they can make money by providing such service to local businesses too. That’s how I make money learning from WA too. I guess that’s why many Done-for-You system program lose their business to Wealthy Affiliate.